Most people engaged in farming are no strangers to expenses. From animal feed, veterinarian visits, and replaced fencing to building pens and purchases animals, almost every action has a dollar amount attached. And when you’re farming for a living, those dollars add up quickly. Celina Industries’ Agri-Barrier Curtains are a great addition to any barn, made from durable polyethylene, PVC vinyl, or insulated fabrics. As the fall begins to take a colder turns, the real value of curtains (which can be chosen to specific needs of the barn’s use) becomes truly apparent. A barn holding livestock is a microcosm of heat systems, where it’s easy to see which changes create what outcomes - the addition of barn curtains allows a greater degree of control over the comings and goings of air. How does this tie in with your expenses? Being able to control the flow of heat lets you keep the heat that’s already been generated by installed heaters. And when the heat stays, there’s no need to add more, right? Energy used to maintain temperatures is greatly cut back, making the energy expense reduced. Water, whether in drinkable form or in pipes or other containers, has the unfortunate tendency to expand when it freezes. In addition to the destruction that this can cause – burst pipes, broken pails, auto-feed malfunctions – it’s very difficult for animals to drink water that has become solid. Should you be keeping cows in your barn, you can keep your cows happy and productive with appropriate temperatures. While cows do enjoy cooler weather, a more drastic reduction in temperature causes them to divert their energy to keeping warm. Thus, less milk. Less milk to sell, well, that outcome is obvious. As is the case for certain animals, they themselves can create they heat they need. Expelled gasses and solids (ahem) release large amounts of heat, which when captured can rival any installed system of heaters. Why waste heat that you get naturally? Barn curtains can be used to trap the specific amount of heat you’re looking for, reducing heating cost to practically zero. So many expenses can simply be bypassed with an up-to-date or well thought out heating system. Agri-Barrier Barn Curtain Systems have been used to great benefit all over the country, giving farmers affordable options for keeping their livestock happy and profits on the up and up. 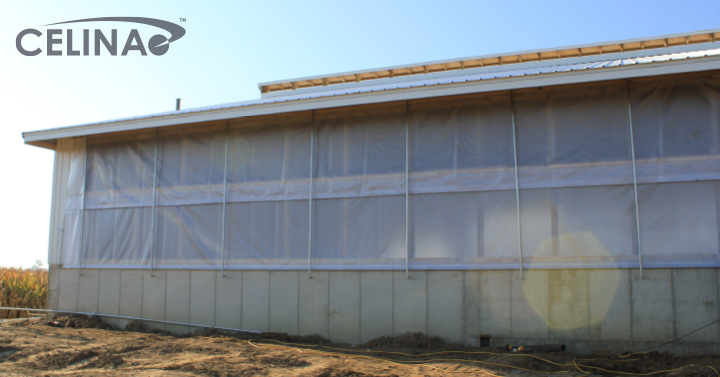 Call us today at 888-986-2026 if you have any questions about Agri-Barrier curtains – our barn ventilation specialist is available to chat about your specific barn set up, and can help you to outfit your barn to the fullest extent.